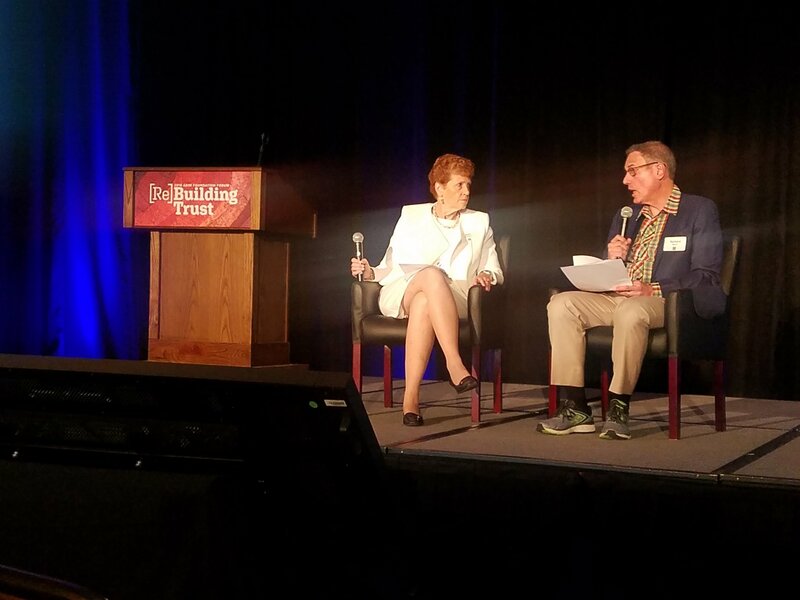 Elizabeth A. McGlynn, PhD, immediate past chair of the ABIM Foundation and Vice President for Kaiser Permanente Research and Executive Director of the Kaiser Permanente Center for Effectiveness and Safety Research (CESR) with Richard Baron, MD, President and CEO of the American Board of Internal Medicine, at the 2018 ABIM Foundation Forum on "(Re-)Building Trust"
Recently, the ABIM Foundation hosted a webinar entitled "(Re-)Building Trust." Oh, the irony. The fact they need to have such a conference is telling of the dire straights the staid and outdated medical credentialing complex has become. 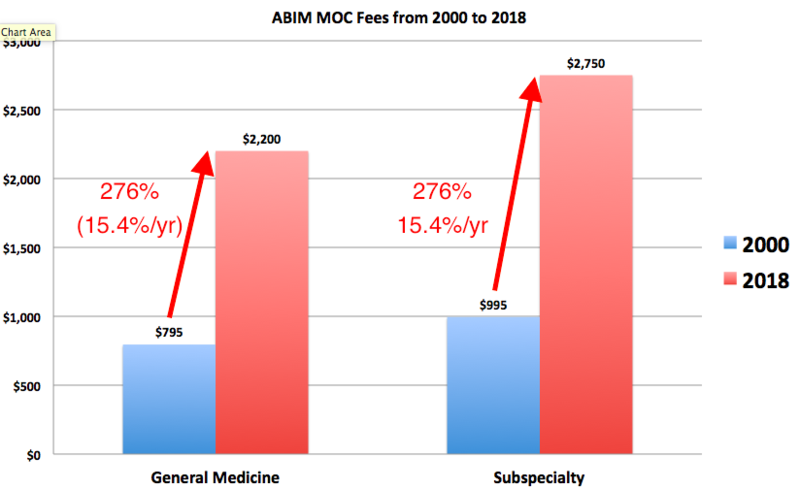 As physicians who funded the ABIM Foundation, why do we fund such nonsense? The American Board of Internal Medicine has never sufficiently explained why this organization felt compelled to use over $78 million of physician testing fees to create the ABIM Foundation or how and why it uses that money. Is it really to fund such conferences? Or might conferences like this really be a distraction for the real reason the ABIM Foundation was created: their retirement fund. By the way, whatever happened to those funds shipped off to the Cayman Islands? Why will we lose our privileges at hospitals or insurance payments if we don't pay into this scheme? And why is the ABIM Foundation colluding with Kaiser Permanente directors? What does Kaiser get for this relationship? If physicians trusted the ABIM, we would not have to ask such questions and the ABIM Foundation would not have to hold conferences on "re-building" trust. Three years ago, Richard Baron, MD issued the now infamous: "We got it wrong" mea culpa press release when the 2014 iterations of Maintenance of Certification (MOC) foisted on US physicians resulted in a powerful working physician backlash. Lots of soft-shoe, "listening," and MOC program changes have occurred since then. But in reality four years later, little has changed other than parsing our payments into annual aliquots rather than a single lump sum every-10-year payment. The growth of fees is back on schedule, climbing an incredible 276% in the past 18 years. Even the ridiculous Part IV of MOC is back as before. It is hard to trust any business, especially a nonprofit organization when they ignore the customer. We should not lose sight that physicians are the customer of ABIM, not patients. We pay for their medical accolade and the paper certificate that ABIM issues when we successfully complete our initial Board certification and (now) subsequent MOC requirements. There are many within the US medical board credentialing system who feel otherwise; for them, they are there to serve "the public." Yet this deflection is little more than a propaganda message created to justify their use of our money for their political and financial purposes. When we see our funds continuing to be wasted at Las Vegas convention venues for American Board of Medical Specialties meetings with their "stakeholders" we realize that this old-school attitude of colleague disrespect and self-importance is endemic to the entire US medical board certification and medical credentialing industry. Hard to re-establish trust with overt demonstrations such as these. PS: Wonder what you can do to change things? Donate here and get a free book at the same time! We're 78% of the way there!